Recently, a friend and I were discussing a common theme in our lives, one that I return to again and again with friends these days—what’s next, and when? And how, exactly, do we answer those questions? My friend referenced a quote, something Krista Tippett had talked about on her podcast or in her book, though she couldn’t recall the source of the quote itself. The idea, though, stuck with her: when we don’t know what to do, it is enough to just sit with the questions, to hold them as we go on living our lives. And then one day, we’ll find we’ve arrived at the answers. She texted me the next day with the full quotation from Rainer Maria Rilke, and I couldn’t believe how I’d missed in her delivery that these are words I know by heart. I wanted to see how far back I’d loved this passage and found it posted on my old, post-college blog in July of 2010. I remember, then, finding hope in this idea that my life might someday make sense, reminding myself to have patience. And the point is, to live everything. I’ve repeated this to myself often throughout the years. But nearly 10 years on, in a different season, this sentiment coming at me through the back door as I sat drinking a glass of wine with a friend, it meant something entirely new. Since then, I’ve figured some things out, but today the stakes are higher and the questions bigger, weightier. I’ve analyzed and over-analyzed them; I’ve written notes; we’ve talked them to death and still they rise. I don’t have the answers. And I like answers. My heart sinks—what is it I’m doing, anyway? Yet. What if we don’t search for answers but live the questions? I don’t know exactly what that looks like, but at the very least, it sounds like a relief. Have patience with everything unresolved in your heart, and try to love the questions themselves, as if they were locked rooms or books written in a very foreign tongue. Don’t search for answers, which could not be given to you now, because you would not be able to live them. And the point is, to live everything. Live the questions now. Perhaps then, someday far in the future, you will gradually, without even noticing it, live your way into the answer. And you know what? It’s true. If I really think hard about the questions I had at 23, it turns out that I have, indeed, lived into the answers. At that point, “everything unresolved” included, for example, the trajectory of my relationship with my brand new boyfriend, Ben, and how I might find my way to the next big career adventure I dreamed of, and my longing to experience life in another place. I have lived my way right into these answers—and beyond. Likewise, these tarts. I baked them first in 2011, when I was over the moon about everything from Kim Boyce’s Good to the Grain. The diverse flours were new to me, whole grains weren’t yet mainstream and I wasn’t a confident baker. I made them for our dear friends Josh and Sara, which I was reminded of last week, when Sara and I were texting about recipes for rhubarb, a shared love—though she is lucky enough to have an abundance back in Michigan, while I’m desperately combing through shops and markets to get my hands on a couple pricey pounds here and there. This is, perhaps, why I so rarely go back to an old rhubarb recipe these days, always wanting to try something new with the few purchases I’ll make each spring. 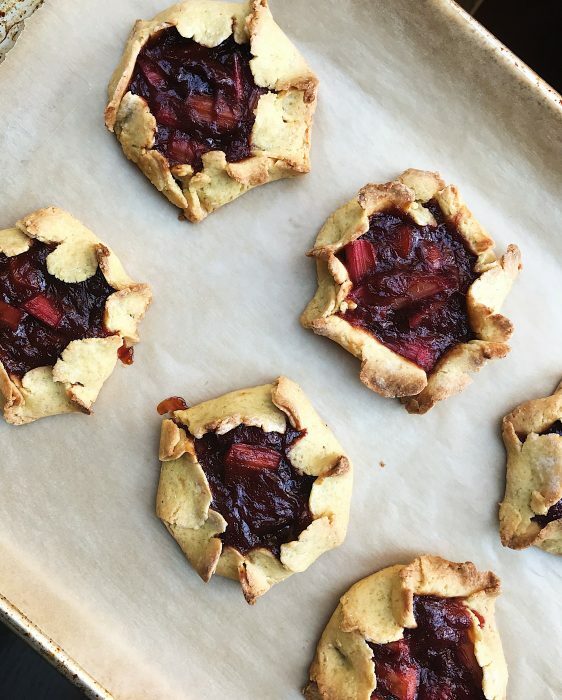 I hadn’t made these tarts for a long time, but I still love rhubarb, cornmeal, a good galette, any dessert you might call rustic. Some things are the same—but others are not. And so even a familiar dish is different a few years down the line. I’m both young and lucky enough to have had only a handful of truly difficult seasons, but they’ve mostly taken place in the last six years. And when I ask what’s next? those experiences come flooding back. My monkey mind tells me that next time I leap, the same crises will follow. Yet the truth is, even if I am confronted with exactly those challenges again, it won’t be the same. Because I am not the same. Ben and I are not the same. Thank goodness for my twenties—but I don’t live there anymore. We can live the questions without fear of the old answers. So here’s to rediscovering the same truths and the same recipes and the same challenges, over and over again—exactly the same, but not the same at all. I love the corn flour and cornmeal here. The corn flour allows for more of that lovely corn flavor without the graininess that would come with more cornmeal. The finished tarts are not too sweet, making them appropriate not only for dessert but also for breakfast or an afternoon bite. Alternately, add a little more sugar to the compote—up to 3 tablespoons, as noted in the recipe. 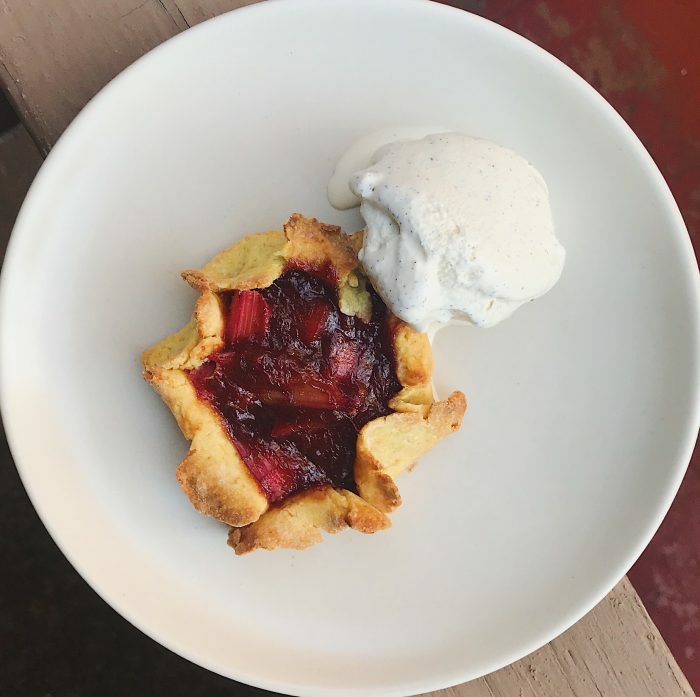 (I dialed it back both for my preference for tart rhubarb desserts and because I scaled down the compote recipe but wanted to keep to easy measurements—15 tablespoons would be the correct equivalent from the original.) These are also delicious with ice cream or lightly sweetened whipped cream. To make the dough, place the dry ingredients into the bowl of a standing mixture, or a large bowl if using a hand mixer, and stir to combine. Add the butter. Using the paddle attachment, mix at low speed to break up the butter. Increase the speed to medium and mix until the butter is as coarse as cornmeal. Add the heavy cream and egg yolks and mix to combine. The dough will be crumbly, but when squeezed between your fingers, it will come together easily. The dough is best shaped right after making it. If you’re not ready to assemble the tarts, refrigerate the dough, then bring to room temperature before shaping. 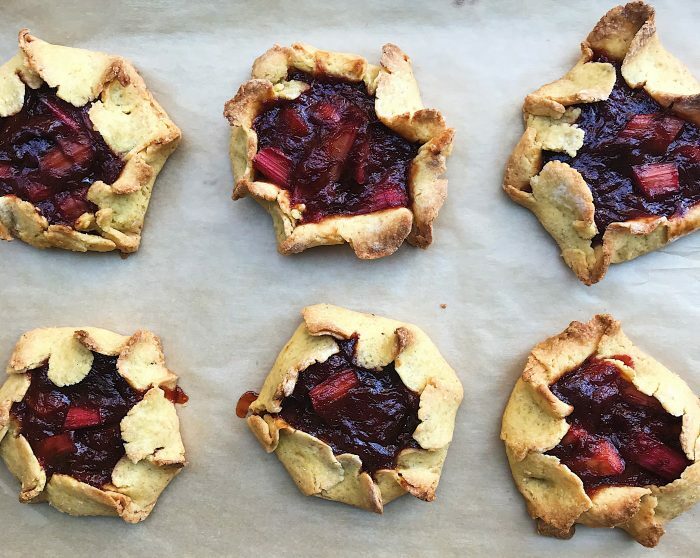 To shape the tarts, divide the dough into 10 equal pieces. Lightly flour your work surface. Start with one piece of dough. Using the heel of your hand, flatten it into a rough circle about 5 inches in diameter and of even thickness. Flatten the edges downward for an elegant finish. Spoon a scant 1/4 cup of the rhubarb compote into the center of the dough. Fold the edge of the dough up toward the compote to create a ruffled edge. This is a rustic tart, so it doesn’t need to be perfect! Slide a bench scraper or metal spatula underneath the tart and transfer it to a baking sheet. Continue with the remaining dough. Put the pan with the shaped tarts into the freezer to rest and harden for at least 1 hour, and up to 2 weeks if wrapped tightly in plastic. Preheat the oven to 375 degrees. Line two baking sheets with parchment. Transfer the tarts to the prepared baking sheet. Bake for about 35 minutes, until the edges of the tarts are golden brown. Serve the tarts warm or at room temperature. They can also be wrapped tightly in plastic and kept for 2 (or so) days. Ice cream or whipped cream make excellent accompaniments. Rinse the rhubarb stalks and trim the ends. Unless the stalks are very thin, slice them in half lengthwise. Cut them on a bias into about 3/4-inch pieces. Set aside 1 1/2 cups and put the rest (about 3 cups) into a medium-sized heavy pot. Add the brown sugar and vanilla to the pot, stir, cover and place over medium-low heat. Cook for about 15 minutes, covered, until the mixture is saucy. Remove the cover and increase the heat slightly. Cook for 15 to 17 minutes, stirring often, until the rhubarb is completely broken down and thick enough that a spoon leaves a trail at the bottom of the pan. Add the remaining rhubarb to the pan. Stir to combine, then remove from the heat. Pour onto a large plate or baking sheet to cool. If you aren’t using the compote right away, put it into a tightly sealed container and refrigerate for up to 1 week. If you have leftovers after making the tarts, enjoy with yogurt for breakfast. just what I needed to read in this current season. thank you! Perfect timing! Someone just gave me rhubarb. Thanks!